Many of the preconceived notions I’d had about Mardi Gras were completely shattered, and what I experienced was completely different than what I had imagined. The most powerful revelation was how family-focused and friendly the Mardi Gras tradition is. I had no idea — watching the city’s collective imagination transform this place into a community of art, music, and friendship was beautiful. For two weeks, this was the happiest place on Earth. Multiple times during my experience, I caught myself reflecting on this transformation, and I couldn’t help but connect my experiences with the college visit. I came up with a few lessons that colleges and universities can apply to their visit programs to leave lasting impressions with every family that joins them. I believe that no college visit is ordinary. Each and every day, as students take their first steps onto a college campus, they open the door to the possibility of transforming their lives and finding the place to become their best selves. 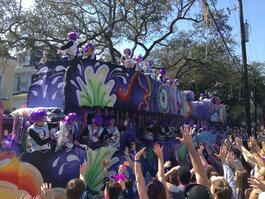 I have been to a ton of parades in my life — but I’ve never been to anything like a Mardi Gras parade. The majesty and artistry of the floats, the passion of the marching bands and dance troupes, the colorful costumes of the float riders … these took the parade experience to new levels. As I read up on the history of Mardi Gras in Arthur Hardy’s Mardi Gras Guide, I learned that each and every parade krewe is rooted in deep tradition. 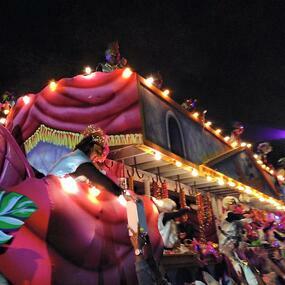 The oldest, the Krewe of Comus, dates back to 1856! Each year, dozens of krewes come together to celebrate their unique stories and New Orleans’ incredible history. New Orleans owns Mardi Gras. Yes, it may have started in Mobile, AL; but early on, New Orleans made Mardi Gras its own. Likewise, every college and university in this nation has its own unique tradition and history to own. Tradition should come alive on a college visit, giving visitors a sense of why this educational institution even exists in the first place. On many tours I’ve attended, these stories are never shared; the tour leaves me wondering what separates a particular institution from the other hundred or so that share a similar profile. Every college has a unique opportunity to own their history and tradition. If you need to understand this more, I recommend a visit to Mardi Gras next year. 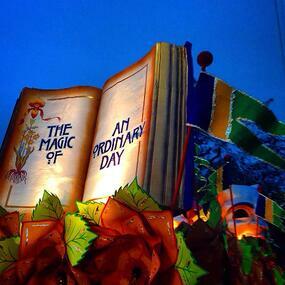 Every parade has a theme, and every float in that parade is decked out in creative ways to share that theme. For example, the Krewe of Rex, one of New Orleans’ oldest and most celebrated krewes, boasted the theme of Wars That Shaped America to commemorate the 200th anniversary of the Battle of New Orleans. Individual floats included nods to that battle and other notable moments in American military history, like Paul Revere’s ride, the Boston Tea Party, and the French and Indian War. Not only were the floats tied into this theme, but the riders’ “throws” (beads, trinkets, stuffed animals, and more) all aligned to share the same story. During many of the visits I attend, I’m inundated with facts and figures easily available on an institution’s website. Tour guides, please tell me a story instead — the story of why you decided to attend this college; the story of a meaningful interaction between you and a faculty member; the story of how this university supports you during challenging times and celebrates your successes. 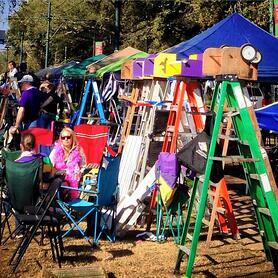 One of my favorite Mardi Gras traditions to learn about was how families purchase and personalize ladders. These are not your ordinary ladders — they include a platform at the top where young children sit during the parades. After watching a few parades from the street, we met another family that offered our children an opportunity to sit atop their ladder. A parent usually stands behind, on one of the higher steps, to keep the ladder’s balance. Watching the parade from this higher perspective brought an entirely new dimension to the experience. In fact, at times it even brought us closer to the action. Watching kids scream and shout for throws, you couldn’t help but be swept into the magic of the moment. This new perspective got me thinking about how colleges can create visit outside-the-box experiences that offer different ways to think about their institution. The majority of tours operate within a very typical structure, but places like Arizona State University are finding ways to bring new perspective to their tours. Arizona State offers students the opportunity to take a skateboard tour of campus, while Bellarmine University in Louisville, KY offers a trolley experience as part of its campus visit. These are just two examples of how universities can get creative to change the way families experience their campuses. In the midst of the Mardi Gras madness, when a large float comes rolling by, one critical element of securing a throw is to make solid eye contact with one float rider. In fact, not paying attention during this process can be a painful lesson; each member of my family was pelted at least once by an object we did not see coming. Making eye contact, smiling, and remembering prospective student names during the tour may seem like very small and trivial elements of the visit — however, these remain some of the most powerful ways to leave a lasting impression and positive feeling in your visitors. Similarly, not doing these simple things can also lead to painful lessons during the recruitment process. Last, but certainly not least, were the incredible relationships my family formed while waiting for the parades to start, or while the children tossed a football in the street between parades. We met and established new friendships with people from all over the country, with incredible stories and deep connections to Mardi Gras. From the family from Palo Alto that comes back for Mardi Gras every year because their mom went to Tulane, to the family from Marblehead, MA that raised family in the neighborhood and comes back every year, to the group of teachers from Houston who came to experience their first Mardi Gras, the stories we heard and the relationships we formed were at the heart of what true community is all about. The campus visit is not just an opportunity for the prospective student and family to learn more about the institution. This time spent together on campus is often the first step in the process of building a lasting relationship with the institution. Even if a prospective student does not end up attending the school, they’ve still established a relationship with the tour guide, staff, and institution. The relationship-building that happens during the college visit is a critical component of the elusive college fit that everyone is seeking. Positive campus-tour relationships light a clear path to happiness during the college experience. These relationships spark a student’s excitement to return, focus on new goals, and join a new community. Here in New Orleans, the energy of the community coming together around Mardi Gras was the true magic of these ordinary days.